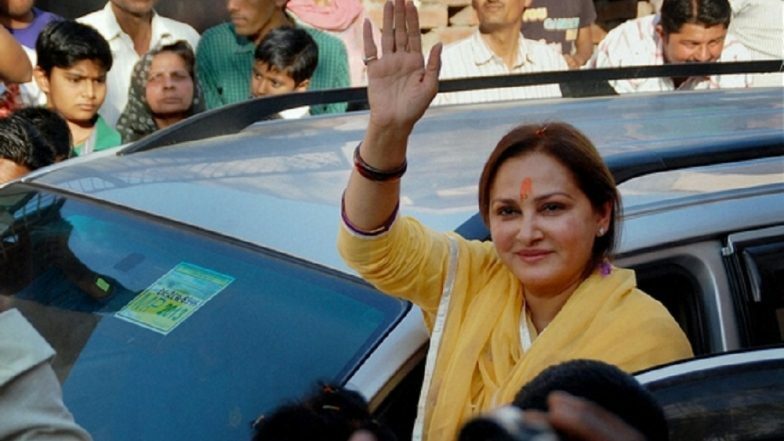 Rampur, April 13: Bharatiya Janata Party (BJP) candidate from Rampur Jaya Prada today launched a scathing attack on Samajwadi Party (SP) leader Azam Khan during an election rally. The BJP candidate alleged that Khan circulated her morphed images in 2009, during Lok Sabha elections. Jaya further added that she even went to Mulayam Singh for help, but he did not do anything. The BJP candidate also said that she always considered Khan as her brother, but he disrespected the relation by using an indecent language against her. Due to this reason she left Rampur, said the BJP leader. Uttar Pradesh Lok Sabha Elections 2019 Schedule: Constituency Wise Dates Of Voting And Results For UP General Elections. The former SP leader joined the BJP on March 25 ahead of the Lok Sabha elections 2019. She is contesting against Khan from Rampur. The relation between both the leaders turned bitter in 2009 after Jaya supported the then General Secretary of the SP, Amar Singh. During the 2009 elections, Khan supporters openly campaigned against the actor turned politician. Lok Sabha Elections 2019 Schedule: Voting In 7 Phases From April 11 to May 19, Counting And Results On May 23; Check All Dates For General Elections. During that parliamentary polls, Jaya had also accused Azam Khan of circulating her morphed pictures in Rampur. She even alleged that SP stalwart attempted an acid attack on her and even claimed that she had received multiple death threats from Khan. Meanwhile, during one of his rally in Rampur, Azam Khan once again made a controversial remark while taking a dig at Jaya. He said, “I didn’t open dance schools, I opened proper schools and universities.” Lok Sabha Elections 2019: BJP will Defeat SP-BSP Alliance in Uttar Pradesh, Says Amit Shah. The Lok Sabha elections in Uttar Pradesh will take place in seven phases on April 11, April 18, April 23, April 29, May 6, May 12, May 19. In the first phase, only eight parliamentary seats went for the polls. The results will be declared on May 23.